The New Economics Foundation has prepared a considered report on the employer costs of loneliness (New Economics Foundation 2017). They found that the total annual costs of employee loneliness is ₤2,265 (NZ$4,408) per lonely worker. This was made up of sickness absence (NZ$39), lower productivity (NZ$1,269), and lower staff retention (NZ$3,100) (see figure). In addition, about 10% of UK workers are also carers outside of work. 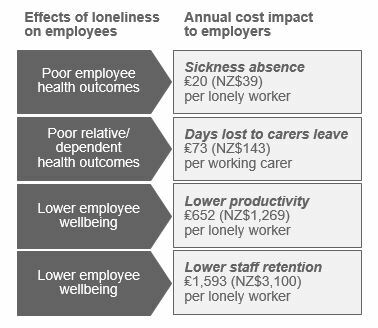 The additional cost to employers of this burden outside of work as it relates to loneliness was estimated at ₤73 (NZ$143) per working carer. To put these figures in context, according to the New Economics Foundation, they represent about 8% of the annual cost to UK employers of mental ill-health. New Economics Foundation (2017), “The cost of loneliness to UK employers”, February. Read the report.